Achievements have become pretty standard in games (and other gamified content, like Stack Exchange) these days. However, they definitely weren’t part of “classic” gaming, in the arcade/8-bit/16-bit eras. So where did they come from? What was the first game to offer them? By “Achievement”, I’m specifically referring to multiple permanent (across-playthrough) awards which don’t directly correspond to whatever progression system the game has. High score boards have been around since the arcade days, but they only track single playthroughs. Bonuses or changes for completing the game also don’t count, because they’re directly tied to progressing to the end of the game. The first form of achievements that appeared, in the way you describe them was on the Atari 2600, 30 years ago. For some of the Activision games on the system, there would have challenges listed in them. 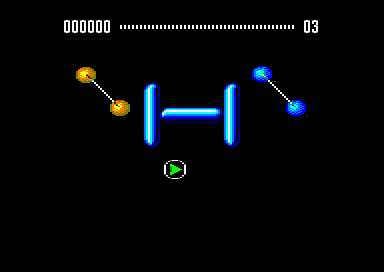 Most often, these were simply "score x amount of points," but there were also challenges such as "finish a level in six seconds", or "survive 5 days". These challenges were listed in the manual of the game. 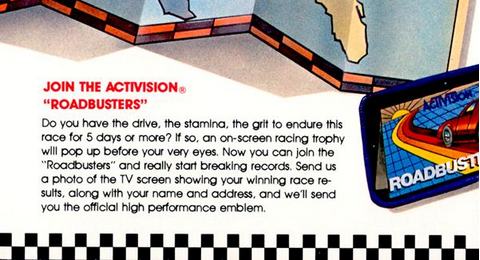 An extract from the manual of the Activision game Enduro Racing. The player would then complete these challengers, take a picture of the TV screen for proof, and put it to Activision in the post. Upon completing the often difficult challenges and sending the proof to Activision, they would send you a decorative fabric patch which confirmed your achievement in the game. 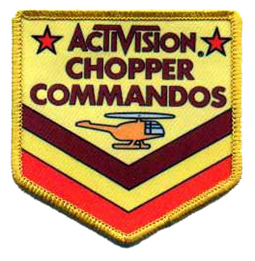 This patch is given after scoring 10,000 points in Chopper Commandos, a difficult feat. The earliest Activision game that included this decorative patch was the racing game Dragster, which you earned by finishing in less than 6 seconds. It was released in 1980, which gives us a definite beginning date for the early forms of achievements as described in the question. These patches were made to show off to friends. You could sew them onto clothing or other items, so that you could tell the world how good you were at the game. These early stages of achievements were entirely offline. The actual game didn't save anything. Completing a bonus level with the last digit of the timer as a "3"
This was closer to modern day achievements than the patches were. For one thing, they were stored on the game itself, rather than just offline. It still lacked, however, the ability to share the achievements online - an important part of today's achievement systems. Where did the sharing aspect of achievements come from? We move forward another 6 years to 1996 - where a website called MSN Gaming Zone would launch. It was designed to be used alongside instant messenging. Due to the inherently social nature of instant messenging, MSN decided to allow one to easily share gaming results to whoever they were chatting with. The games also included "badges", which were earned for doing specific things in the games. This started the social aspect of achievements - you were encouraged to share badges with your friends online. Finally, we reach 2005, and the introduction of the Xbox 360. This tied together all of the parts of the previous iterations of achievements into a cohesive whole. Part of this was adding in the "GamerScore" which created a positive feedback system for learning achievements. The achievement system in the 360 was completely integrated within the game. This was so effective that today the Xbox 360 is widely considered to have popularised achievement systems in pretty much anything - the PlayStation Network, for instance, introduced the similiar Trophy system in 2008. Also, I highly recommend reading the fifth link there. It is actually really interesting. Not the answer you're looking for? Browse other questions tagged achievements gaming-history or ask your own question. What is the origin of the WASD key scheme? When were achievements, especially their timestamps, introduced to Steam?